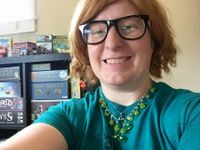 Tessa is an avid board gamer and reviewer at boardgameduel.com. She designed her first game after being inspired from teaching her Board Game Design class to middle schoolers. Tessa is the co-designer of Duel List, alongside her husband James Van Boxtel.